Flying on Jeju Air was one of the top priorities in my list. Why? Mainly for the livery - its eye-catching and also flashing off my favourite colour, orange! So which route would I fly on this airline? I could do a domestic flight, but then when I did some homework, I noticed this airline was offering a very good price on ICN-NRT sector! After registering with the airline, I would only pay S$120 for the one way ticket and that includes luggage. This was one of the first flights I booked. As there were 2 flights , I picked the first flight which departs ICN at around 0830, hated this timing as I had to get up very early to get to the airport, but the catch was, I would get to spend some time at Narita Airport for spotting before my next flight to Sapporo with Vanilla Air. Now, this is the downside about the airline. It's more than frustrating when it came to making the payment! First, the website required the crappy Internet Explorer in order for the payment section to work. Next, when I clicked the button to make the payment, the page went error. It took quite a number of times before the payment finally went through. Subsequently, I received the email and my trip was confirmed. Selection of seat was part of the fees so no issue with that. The airline blocked out the front and emergency row and apparently give them to passengers on first come first serve basis. I woke up around 5 in the morning and decided to take the bus 6015 to the airport. It was just less than a minute from the hostel. I stayed in the Elm Green Guest house which is conveniently located between Seoul Station and City Hall. When I reached the bus stop, there were a crowd of fellow passengers waiting for the bus and the bus came, packed with passengers. I was lucky to have gotten myself one of the last few remaining seats. At the last bus stop before the bus entered the highway, he bowed to all of us and spoke some Korean which I did not understand then drove all the way to the airport. The ride took about 45 minutes. Once I reached, I made my way to the check-in counters. Checking where my flight is, I proceeded to row H. I like this airport, as it has free wifi and a passenger-friendly airport. The check-in counters were not opened and there was a long queue when I reached there. This airline, like the other Korean LCCs, do not offer online check-in, therefore you have to queue up. Fortunately, there were many opened counters, so waiting time wasn't too bad. The staff counter wasn't unfriendly but she was following the rules, insisted on seeing my flight itinerary to Singapore. First time for me and after showing to her, only then she printed out the boarding pass for me. But just before she did that, she went to her supervisor to verify something, not telling me anything. Nah! I didn't need this, not a criminal or anything. Nevertheless, I got my boarding pass and off I went! Heading to the air side, looked like a very crowded morning! It was quite foggy that morning, no sign of cancellations of flights though. See how bad the visibility is? My ride to Tokyo Narita- HL8263! Happen to have gotten one of the 737-800s with some special decal near the rear of the aircraft. Boarding started early, we made our way to the gate which led us to our aircraft. I was initially worried because there was another 737-800 parking just beside it and we might be led to that aircraft instead. Fortunately, we headed towards the direction of my desired aircraft, HL8263 and this time I took my favourite row. Great on the Airbus A320 but too front for my liking on the Boeing 737-800. This is the reason why! I had to bend my body to get this shot, a bit obvious for others to know of what I am doing. Have to take a few rows back the next time I fly on a full Y class configured Boeing 737-800. Once on board, it was time to snap some photos of the cabin! Do you like the design of the fabric? I do. Tight seat pitch like the other Low Cost Carriers. Seat comfort was not too bad while the legroom space is tight but bearable. Not used at all during the flight. For short flights, bring your own entertainment such as Ipad or Galaxy Tab is good enough. Can't complain at all for the price you are paying! The usual photos of the toilet! Standard like others. No BSI on this aircraft either, I guess none of the 737 Korean carriers apart from Korean Air has the Boeing Sky Interior. Full was almost full with a few empty seats spotted at the rear. The ride from Seoul to Tokyo was mostly smooth, with a few bumps here and there, nothing major. And once again, on my last Korean airline flight for this trip, a complimentary drink was served. The Korean LCCs should also offer hot meals on board especially on international routes. The cabin crew were friendly and I have no complaint about them. They were professional and courteous and do speak good English at least with this set of crew. Announcements however were only in Korean and Japanese, so I had no idea what they were talking about most of the time! There were some Caucasians on board so I found it pretty strange not to have English announcement. 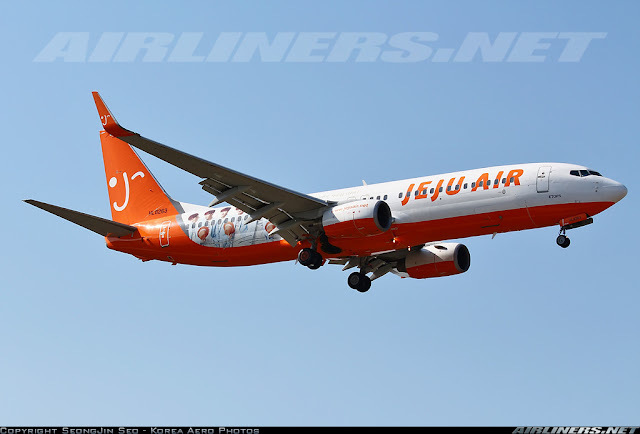 Here are some videos of the the take-off and landing of my Jeju's flight! Here are my window shots photos! I will fly on you one day, Asiana Airlines! The airline's logo certainly looks great on the winglet. Spotted JA01VA which would take me to Sapporo that afternoon! JA01VA, the first Vanilla Air's A320 in the fleet took me to Sapporo later that day, you can check out my trip report over here. Nice to see VH-EBC (Jetstar's A330 in albino livery, the only one) Flew on it before on JQ7 MEL-SIN route. My trip report of this flight is here. Overall, it was an enjoyable flight. Even though its a Low Cost Carrier, it was money well spent. I find the Korean hospitality better than the ones in South-East Asia. This was my last Korean airline for this trip. The only major airlines I haven't flown in Korea is (at this point) Jin Air and Asiana Air. I have plans to do that in the near future. So far I have been impressed with the airline's in-flight service. I had no problem with any of the crew I met so far, they were all friendly and treated me well. So you can be assured of quality service and reliability when flying on any of them. The Y class seats are reasonable, tight seat pitch but bearable for 2 hours or so, so far which is the best Korean LCC? I will reveal more of that in my future trip report. Do take note that the Korean LCCs do not offer on-line check-in so do go early to avoid the long queue. For airline's website, I vote for Air Busan to have the best website among the Korean carriers and Asiana Air to have the worst! Hope you have been enjoying my trip reports so far. Hi, are they very strict on the 15kg baggage weight? Hi MQ, usually LOw Cost Carriers are and it's expensive to pay for the excess weight at the airport. Thank you so much for your usefull reviews! Does Jeju Air serve complimentary drink on your flight to Japan? If not, how about water? Yes, a choice of orange juice and water. You can ask for a refill. Hi, Charles. 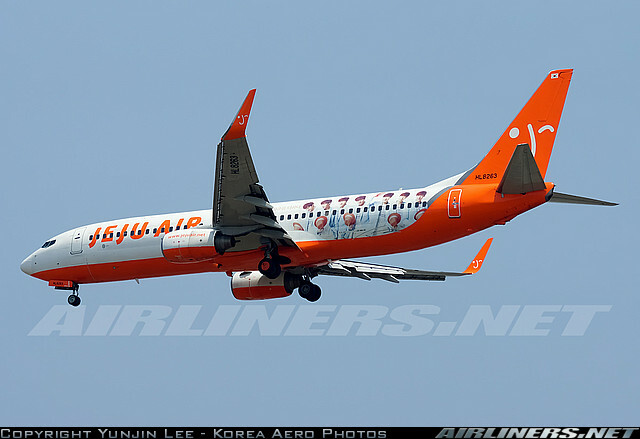 I charged my flights with Air Busan and Jeju Air using my credit card. The "sale" was still pending via my cc company. Does it usually take more than a week long? I even got ticket numbers for my reservations... Would you know anything about it? No, it shouldn't take more than a week. Contact the airline directly about it. When I did the booking with both airlines, I got my ticket issued immediately.